Discover BRITTANY AND ITS FAMOUS SITES! No region is better than BRITTANY for such a wide choice of holiday activities: seaside landscapes by the bay of Douarnenez or the Crozon Peninsula, beaches and coves to discover as you walk along the coastal path, a rich architectural heritage and history… Brittany will not cease to amaze you! There are many shows and Fest Noz, especially during the summer. Located near the sea, Brittany has a healthy oceanic climate, in which a wide variety of colorful vegetation grows. And food lovers will rejoice because as everyone knows, Breton cuisine is extremely popular. The Pointe du Raz, symbol of the end of the world, is the natural site not to be missed in Brittany. A spur of granite jutting out into the ocean, the Pointe du Raz is a longer point than many others. Located west of PLOGOFF, it forms a figurehead 72 meters tall that dominates the Raz de Sein, a current like none other in Brittany. Labelled a Grand site de France, this combination of sites is unique in BRITTANY. The Pointe du Raz’s beautiful landscape reveals the richness of its heritage and cultural identity. The changes in sunlight and ebb and flow of tides offer new views and sensations every minute. LOCRONAN’S major architectural heritage – preserved very early on – gives this village a unique character. Today, LOCRONAN has been labelled as one of the most beautiful villages in FRANCE. Around the church, the rooftops of the village are works of art. The village has preserved a central cobblestone plaza adorned with a well, the great Saint Ronan Church, and renaissance homes in granite from its belle époque. Many movies have been filmed in this gorgeous village such as: “A Very Long Engagement”, “Tess”, “Chouans!” and many others. QUIMPER, town of ART and HISTORY, has more than one wonder to share with you. Learn about the legend of King Graillon, discover the story of Santig Du, wander through the medieval city, hear the echoes of markets, the many colors of the Cathedral of Saint Corentin, walk the Quais de l’Odet and the 19th century bridges. Come discover the riches of the capital of the Cornouaille. Eat a delicious crepe in one of the many restaurants of the place au Beurre in the heart of old town. The many plazas invite you to take a moment and relax. Place TERRE au DUC, Place SAINT-CORENTIN, Place BERARDIER, esplanade FRANCOIS MITTERAND. Don’t forget to walk towards LOCMARIA, birthplace of QUIMPEROISE earthenware!! The Ile de SEIN is an island in BRITTANY located in the southeast Celtic Sea and 7.2 km west of the Pointe du RAZ, on the other side of the Raz de Sein. The narrow streets criss-cross each other to offset the wind and spray. The island spans 2 kilometers and forms a backwards S with a strangled central portion that is barely 50 meters wide. The Great Lighthouse of the Island (Goulenez) is located on the far western end. This carless island is accessible to all. The Crozon Peninsula – which is named for its largest town, Crozon – is located on the far west side of Brittany, in the center of the Finistère and its jagged, cross-shaped coast, forming the backbone of the trident in which the Breton peninsula ends. It is surrounded by the sea on three sides: to the north by the Roadstead of Brest, to the west by the Iroise Sea, and to the south by the Bay of Douarnenez. To the east, at the entrance to the peninsula, there is the Ménez Hom, a mountain at the end of the Black Mountains chain. Surrounded by the sea, the peninsula is known for its rich landscape and other natural sites: the Cap de la Chèvre, the Pointe de Pen-Hir, the Pointe du Toulinguet, the Pointe des Espagnols, Dinan Castle, the Roscanvel Peninsula and the Aber de Crozon are among the most famous. The peninsula is of great strategic importance, as can be seen by its rich architectural heritage and strong military presence. A trip to the Crozon Peninsula is a very popular thing to do in Brittany. Le Guilvinec is the top artisanal French fishing port in value caught on French ships. It is the biggest maritime district in France for fishing both in terms of number of sailors (around 1000 sailors) and in terms of value of fish caught, 17.5% of all French fishing. Haliotika – the fishing village – is where you can watch the trawlers come in, visit the fish market, and try Norway lobster. On your way back, stop at Penmarch and climb to the top of the ECKMUHL lighthouse for a panoramic view of the ocean. Third-largest city in the Finistère by population, Concarneau is located on the Cornouaille coast in the La Forêt Bay. The city was constructed during the Middle Ages from the walled city in the MOROS estuary. Its location on the coast and history make it a favorite destination in Brittany. The Glénans archipelago or Glénans Islands – locally known as “The Glénans” – is a Breton archipelago in the Bay of Biscay south of Fouesnant in the Finistère. It has nine main islands and many islets. You can head out to the Glénans archipelago from BENODET. Sand beaches, turquoise sea, wild landscapes… Get on board to visit this Natura 2000 site. The boat docks at Ile Saint-Nicolas, which has several houses, the international diving center and a fish pond. You can take a trail around the island, and enjoy beautiful views of the coast, from Penmarch to Pouldu. This hiking trail passes through the beautiful landscapes of Brittany and especially through the Finistère. Some sections follow old customs paths that were abandoned in the first part of the 20th century. The GR34 was fully opened in 2008. The first section was marked in 1968 between Beg Leguer and Pors Mabo. The GR34 is so long that it is very difficult to do all at once, unless you want to trek for several months. Most people do small sections at a time over a couple of days depending on how long they are available. There is an excellent section between Douarnenez and the Pointe du Raz. A little Breton port with streets full of history, this fishing town is located on the Goyen estuary at the foot of a wooded hill. 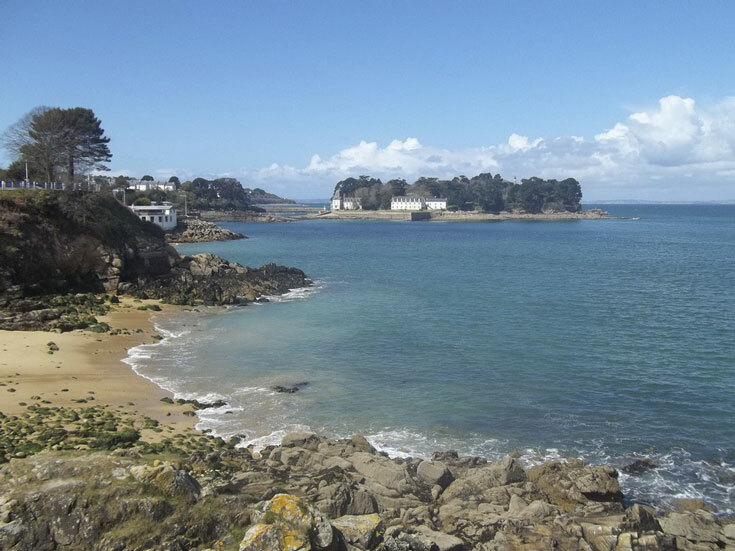 Mostly spiny lobster, lobster and a particular species of spider crab that has developed on the coast of the bay of Douarnenez are fished here. Capital of the Pays Bigouden, in Pont-l’Abbé you can discover the traditional Breton costumes and headdresses at the Festival des Brodeuses that takes place every year in July. This town specializes in embroidery and doll making. Located at the end of an estuary, Pont-l’Abbé is named for the first bridge constructed by the abbots of Loctudy between the port and the lake. This small, ancient town sits on the right bank of the Goyen, also called the Audierne river. Picturesque cobblestone streets (through which the August 15th parade passes) lined with old houses descend to the bridge over the river. Take the Petite Rue Chère and Grande Rue Chère and explore the picturesque streets.